Togo (pop. 5,946,000; GDP/cap US$433) is a narrow piece of land between Benin and Ghana. It fell under authoritarian rule after independence from France in 1960. In 1967 Gnassingbe Eyadema seized power in a military coup and ruled till his son Faure GnassingbÃ© succeeded him upon his death in 2005. The fraudulent polls which accompanied the succession triggered intense civil unrest, prompting a harsh military clampdown and an exodus of over 30,000 refugees to neighboring Ghana and Benin. International aid for Togo has largely been suspended, hitting Togo's already weak economy. 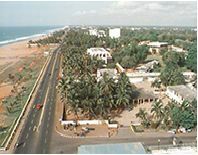 Lome, an important port for the inland countries of Mali, Niger, and Burkina Faso, has seen its trade decline due to security concerns. Foreign purchases of real estate are subject to government controls.